Jackie Chan’s latest east meets west action comedy casts Johnny Knoxville in the goofy, bumbling, untrustworthy American role that we’ve seen Owen Wilson and Chris Tucker play in the Shanghai Noon and Rush Hour films respectively. But true to form, even though they begin as rivals, they’ll soon be forced to work together. 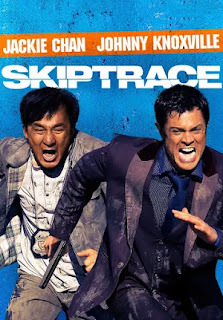 In fact, Skiptrace plays like a version of Shanghai Noon that takes place in modern times and spends much of its time hiking through some of mainland China’s most stunning and picturesque landscapes before heading back to Hong Kong’s also picturesque cityscape. Knoxville plays Connor Watts, a gambling conman who managed to get himself in trouble with both the Russian mafia and the Hong Kong police. The latter of which finds Jackie Chan’s detective Bennie Chan forced to capture Connor away from the murderous Russians in order to get his help in solving a complicated series of crimes that took place in Hong Kong and Macau. Connor had robbed a Macau casino and inadvertently witnessed a crime Bennie had been investigating. As a result Bennie is convinced that Connor can help him identify the criminal mastermind behind everything. However, fleeing the Russians proves to be a difficult task that leaves them slowly trudging back to Hong Kong from Russia the long way. Their slow journey takes them through Mongolia, where they stop to play a drinking game with the locals that vaguely recalls the one played in Shanghai Noon. But things spin wildly off the rails when Chan and the camp break out into a highly unlikely choir version of Adele’s ‘Rolling in the Deep.’ Knoxville and Chan’s discussion of how he knows the song comes across as a Rush Hour reference. But things take a turn back toward Shanghai Knights as the two venture further south through mainland China’s expansive tea fields discussing their desire to have a family. It’s here that Conner reveals his attraction to a young woman near and dear to Bennie. Yet Bennie’s distrust of his new American cohort and his intentions for the young woman feel like a weak attempt to recapture one of the major through lines in Shanghai Knights. The obvious problem here is, as pretty as some of this film is to look at, we’ve seen it all before only with far more likable characters, much more compelling action sequences, and comedy that was actually funny. The narrative here is murky and muddled at best, and it isn’t helped by the fact that each scene tends to end with an unfunny punchline of sorts. The film fails both as a comedy and an action film. I’d place the blame solely on Knoxville, who lacks the screen presence, wit, and charm of Owen Wilson or Chris Tucker, but Chan seems to be phoning it in as well. Despite being over-the-top, Jackie Chan wrote the book on making well choreographed, light-hearted action comedy. Say what you will about him and his style - for that matter say what you will about Shanghai Noon and Knights, movies that have long been guilty pleasures of mine - but his Buster Keaton-like ability to choreograph and stage both visually appealing and comedic action/fight sequences have inspired many and has granted him a long and lucrative career. Yet none of that is on display here. It becomes clear very early on that Skiptrace is little more than an underwhelming attempt to recapture the spirit of Chan’s better work. Director Renny Harlin, whose work includes similarly over-the-top films like Cliffhanger and Deep Blue Sea, doesn’t fair well in trying to capture Chan’s fast paced fight sequences in visually interesting ways. In fact, I cannot recall a single sequence that stands out. And Chan, who came up with the story, concentrates on his typical themes of teaching westerners about Chinese ideals like honor, decency, and loyalty while the westerner teaches him about relaxing, going with the flow and being more open to new things. There’s also a twist that doesn’t have the surprise factor they’re hoping for simply due to a particular piece of casting. Though, on the off-chance you’re still interested in seeing the film I’ll leave you to discover it. As someone who still looks back fondly on some of Chan’s earlier successes, it’s disappointing to see how lackluster some of his later work has become. Though considering this never got a wide release here in the states, perhaps I should have known better.